Andrew Walter, whose tasty art has graced some of the ttrpg books put out by the Melsonian Arts Council and whose art can be found here and here did a playthrough of Reckless. He graciously allowed me to post his playthrough and thoughts here. Yesterday we found a spare table at Dragonmeet and sat down to do a playtest of +Matthew Adams rpg/boardgame hybrid Reckless: Fairy Tale. The short version is we had a hilarious forty-five minutes playing it! For a more detailed AAR, read on. - Got ‘stored’ on a high shelf by a giant sized ghoul and had to sneak out on a makeshift rope of ogre-intestines. - Grabbed a crown from a corpse before it teetered into a yawning gulf, and gave it to Barry, who promptly entered a chrysalis state, then grew wings. - Flew on the back of Barry over a walled city, and had to use skilful pipe-smokery as chaff to diffuse the swarms of arrows that shot towards him to the sound of distant cries of ‘kill the dragon!’ from below. - Crossed an ocean-spanning bridge constructed of headstones, cemetery gates and mausoleums. Found a ruby the size of an eyeball in a mausoleum, triggered a Star Wars style stone wall trash compactor trap and had to punch his way out with brass knuckles. - Entered a ‘castle’ in a swamp to sign the visitors book. The castle turned out to be a huge mouth with mimicry abilities. He tried to impress the immense building-monster by singing to it and taking advantage of the acoustics inside its vaulted mouth, but failed to impress, and got swallowed. - Had a sword fight with a blackened robot horse in a field of rust. - Entered a jousting contest with a knight who had no skull, just a floppy boneless head. Had to use Phillip (a local peasant who derived possibly perverse satisfaction by living ‘as a horse’) as a mount. Was rewarded in the traditional way by having his own skull and brain implanted into his much beefier opponent, hence being re-born as Sir Strong of Buffington. - Found a village of crones at the base of a statue, one of who accused him of forcing her son to live as a horse. Entered a singing contest with them to retain Phillip. Placed last due to unfamiliarity with his new larynx and lungs. - Got turned into a toad by a crone’s magical energies as he was trying to rustle Phillip in the middle of the night. Still managed to escape while on Phillipback. - Got entangled in a suddenly sprouting proliferation of gigantic mushrooms, and began to hallucinate. - Was attacked by a miniature army of halberd wearing ants that emanated from a nearby well. - Found a titanic robot in a rust field studded with prison cells, out of which stretched the pleading arms of tortured prisoners. The robot was powered by the anguish of the damned. On the top of the head was a lush garden with water features and leaping deer, and a self-appointed king operating the robot’s strides with two levers. A fight ensued and the “king” was thrown over the side to his death in the rust fields. Spider took control of the robot and walked halfway across the land. - The titan robot walked into hex 14, but was so heavy that it got stuck in the ground up to its knees, and the surface of the lush green storybook kingdom rucked up like a cheap rug, revealing a bland expanse of cold stone underneath. The princesses tower listed over alarmingly. The neon knight guarding the princess attacked the spider and a battle ensued. The princess got bored of waiting for the fight to end and hopped out of the tower. The Giant-Spider-In-Boots revealed to the princess that he was actually her father, but the Neon Knight proclaimed them abominations and slew them both. Or at least attempted to, because each half of the princess sprouted legs akin to those of her father and stood up anew. Sir Strong of Buffington kissed one half of the spider-princess and was returned to his human form. Rode off with her into the sunset on the back of Phillip the horseman with the Neon Knight in hot pursuit. The Blacksmith turned up to find that the tower had toppled over, and everyone had gone elsewhere. We had an awesome time with this one. It was a lot of fun how free form and crazy this is, and it goes without saying that Matthew’s art goes a long way to making it feel like an evocative world. The freewheeling feel I got from it reminded me a lot of Tales Of the Arabian Knights, but restrained only by the players insane imaginations. We played with only three players, and I kinda feel like this was designed for more? Matthew mentioned he’s run it for 9, so perhaps it would benefit from a more numerous group, although I feel like it would be difficult to remember where certain characters had ended up last time with so much going on. Setting target numbers for tasks is difficult. People were quite conservative with their luck so often had a lot of luck by the time they got to the scenario/RPG phase of their turn. I didn’t get a handle on whether or not it was good form or not to set high target numbers if someone had amassed a large amount of luck. I don’t think we had anyone set a target number lower than four? It doesn’t mention in the rules at the moment, but we assumed that anyone that rolled a tie when seeing who the DM would be would collaborate together on the scene for the active player, which was really fun in and of itself. At first I thought like this would be a great way to introduce DMing to those that hadn’t roleplayed before, but I think I changed my mind. It actually requires quite a lot of DMing skills like improv, thinking on the fly, even-handedness, a decent memory etc. and it was surprisingly challenging! Maybe that’s just me not being that great at improv though, and maybe I’m underestimating people’s potential shyness. We used one die on the die-drop and Matthew’s since said he uses two, for extra inspiration/combos. The game rules advice that the current DM should set up encounters that only have one skill roll, but we had two or more sometimes and it worked fine. It might be that we were more willing to stretch out the roleplaying longer because there were only 3 of us. No-one took the magic skills, so I took a thesaurus to a game convention for no reason. 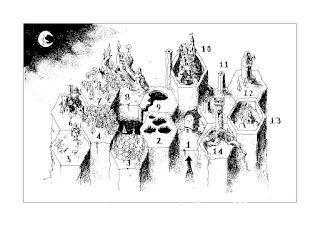 I’d like to play again with a mage character as I’m very intrigued by freeform magic generation like the system in this and in +Ben Milton's Maze Rats. One thing we had a little bit of confusion with was that sometimes we had to make a judgement call on whether we'd narrate the encounter on the space you started in or the space you were about to move off of. Sometimes it seemed appropriate to do one, sometimes the other. Anyway, looking forward to seeing where this goes next Matt! Anyone even vaguely interested should give this a try, with the right group of people it can be a blast – everyone in my group certainly enjoyed it and were even inspired to start talking about sci-fi reskins and such! What is Reckless and what am I doing?